Nether Wallop Trading - Amnesty International UK shop. Fair trade. Organic. Ethical. 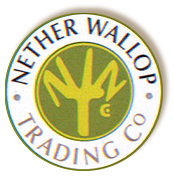 Nether Wallop Trading design and develop innovative eco-friendly gardening products. It was founded in 1993 when people started to be encouraged to recycle and really think about the environment. Central to their thinking is William Morris's philosophy of combining use and practicality with beauty and good design. Many of the products are based on traditional designs and the wooden products are made from sustainably managed (FSC) wood or from salvaged wood.